The Bot 700 is a well-designed, simple but multi-functional piece of equipment. The major changes from its predecessor, the 1L Bot, are a smaller capacity/size, lighter weight, and the addition of folding handles. I was impressed with the Bot 700’s ability to serve as a pre-soak/water container, pot, mug, and in a myriad of other functions and processes. 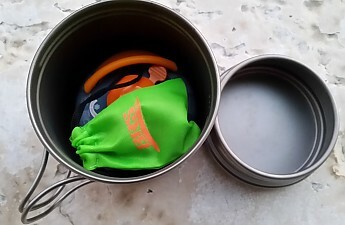 With the exception of some difficulties with cleaning and cross-threading the lid, I found the Bot 700 to be worthy of consideration for my ultralight thru-hike kit. The original 1L Bot does not have handles but its successor does. This, combined with the reduced size, is perhaps the biggest improvement, as it makes the Bot 700 both easier to handle as a *hot* pot and also a very suitable mug/cup. A few notes of caution here: As a metal, titanium is not a very good heat conductor. 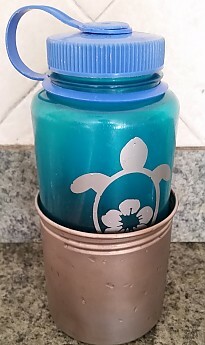 So I did not usually need skin protection when grabbing the handles or taking a sip, but it is a wise practice, none-the-less. 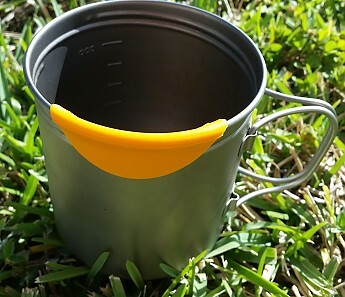 There are many obvious hand-protectors (socks/gloves), while silicone Snow Peak Hotlips offer a simple means to turn a metal pot into a sipping cup. The handles are easy to grasp with my small hands. Pro tip: when heating stuff, keep the handles slightly separated from each other and they won't get as hot. Also, cooking anything other than water in a Ti pot can be tricky. Titanium is notorious for developing hot-spots and burning food. Simply put, Ti is the fast and light choice (did I also mention expensive? ), and not for cooking elaborate meals in the backcountry. I will refer the reader to this Trailspace discussion for more on the virtues and shortcomings of aluminum, stainless steel and titanium. Another feature of both Vargo Bots is that the screw-top lid can be flipped-over to nestle upside-down as a loose lid. Never heat the Bot with the lid screwed-on in container mode, for reasons that should be obvious! Also note that the lid will get pretty hot when boiling water, so use caution in removing it. 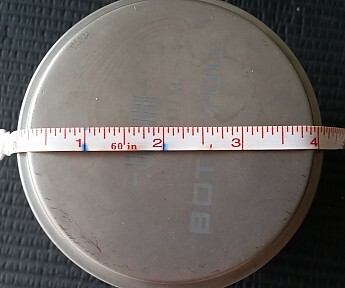 This picture shows both the nesting lid and 100 ml measuring marks, from 300-600 ml. 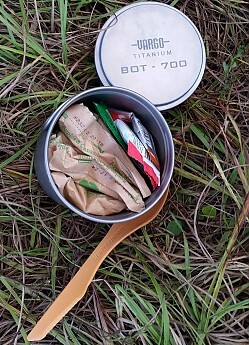 I was able to test my sample with a MSR PockeRocket, BRS-3000T, and Jetboil MiniMo stove with pot adapter. 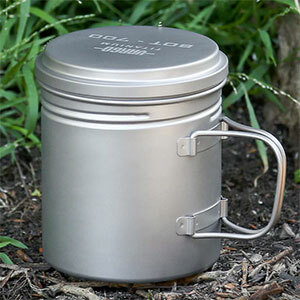 The 3.8" base is a good size for these compact canister stoves, and feels stable when filled with water. 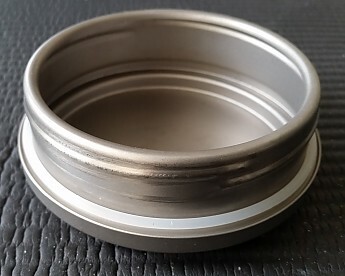 It fits equally well on my Solo Stove, though Vargo cautions that the lid should probably not be used in conjunction with wood stoves, so as to avoid damage to the heat-resistant silicone O-ring from overlapping flames. The O-ring can also just simply be removed from the lid. I only did one timed boil test, using the smallest and probably least efficient BRS-3000T stove. It took 5:15 to boil 500 ml...not Jetboil speeds but respectable. 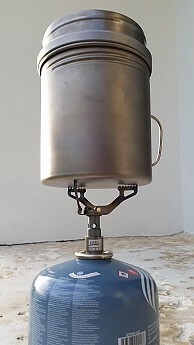 In following, the Bot should be compatible with just about any commercial or hand-made stove, regardless of fuel type. While not specifically prescribed, the Bot also seemed to fare just fine placed directly in a fire/coals. I was loath to do so, since I didn’t want to blacken the beautiful surface, but the soot washed off easily. I probably wouldn’t do this regularly but then again, outdoor equipment should get used as is it needed and I wanted to test this very basic function. I have begun to delve pretty deeply into the ultralight (UL) realm in the past year. As such, I have pared-down stove components/options and ultimately, just gone stove-less. 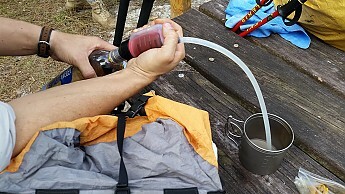 For the past three multi-night backpacking trips, I have used nothing but the so called ‘cold-soak’ method. This is a style adopted by many thru-hikers to further simplify and reduce their load. In this greatly abridged process, dehydrated meals are pre-soaked in cold water for a few hours to half a day, depending on the food. My favorite couscous (shown in the picture below) meal takes less than 20 minutes of cold soaking to fully re-hydrate (aided by +70 degree ambient temperatures, granted!). Since most meals require longer soaking times, the logical solution is to mix the meal mid-day/late-afternoon and carry it around in a sealed container, to be eaten later. Overnight-soaking is also a great idea for breakfast steel-cut oatmeal. 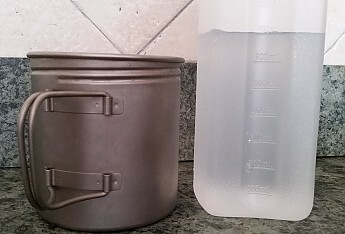 Even if you can’t abide a cold meal, pre-soaking is still an efficient method to reduce the amount of fuel needed to fully cook a dehydrated meal. 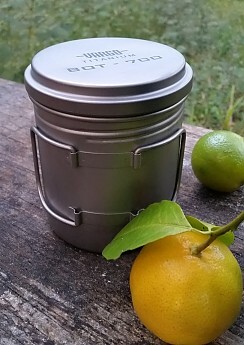 I was initially attracted to the Vargo Bot 700 because of its similar size to my cold-soak container (a recycled Talenti gelato screw-top), plus its ability to pull double-duty as a cook pot. 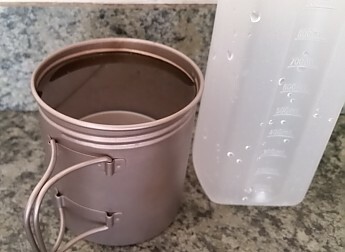 I found that the size was just about perfect for soaking all my dehydrated meals, even 2-person serving-size options from Mountain House and Good To-Go. The silicone O-ring is approximately 3/16" in diameter and provides a good seal. I did not experience any leaking. I offer some more thoughts and comparisons of UL options later in the review. The potential of a simple container is limited only to one’s imagination. For instance, I used the Bot as a water scoop and filtering/disinfecting container on many occasions. It is particularly apt for treating water with a UV device, such as a SteriPEN. Additionally, it can serve as a crush-proof, dry container for protecting small electronic devices and delicates. 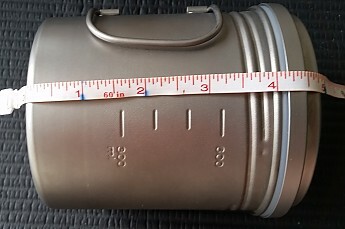 It is also a rodent-proof container for storing small toiletries and/or snacks overnight—you know, the last-minute, overflow stuff that doesn’t make it into the bear bag or canister. It can even be hung from a tree by the handles. Lastly, the Bot is good as an additional mug, cup, or bowl, complimenting a larger, multi-person cookset. 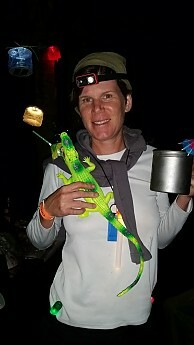 The trendiest new cocktail glasses for 'Crocktail Hour' on Fisheating Creek paddle rendezvous. For easy accessibility, the Bot packs into the side pockets of most backpacks. This is a good idea if pre-soaking or carrying water, in case of a leak. But generally I preferred to store it in the main compartment to protect it from unexpected hits. To save space, a standard Nalgene bottle will fit inside, as well as a 3.5 oz canister (but not an 8 oz canister). 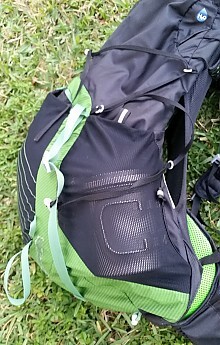 There are not really any sharp edges that can damage other items inside your pack, but it might make sense to take care in placing the handles where they can’t rub against a thin pack-liner. The only issues I had with the Bot were with the screw-top lid. For one, the finished edge of the lid curls inward (see picture). 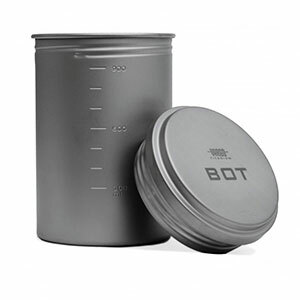 This results in a more durable, polished and edge-less interface so that the lid can connect easily into the threads of the pot. Yet it also creates a lip that can trap food residue. To a lesser extent, so too can the indent at the top of the lid (which enables nesting inside the pot when turned upside-down as a cooking lid). But a simple toothbrush can tackle these challenges, which are only a problem if the Bot is used to pre-soak. 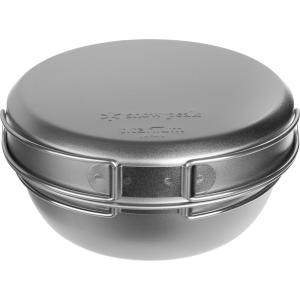 Generally, the inside of the lid does not come in contact with food when cooking. The best closeup I could get of the lid lip, visible at the bottom of the picture. A potentially more serious problem arose when I managed to cross-thread the lid. Fortunately it happened on the last night of a multi-day trip and I did not realize the mistake until I had returned home. I had sealed the Bot in the dark the night before, not bothering to clean it after dinner (it’s easy to be lazy on the last night!). As I went to clean it in the sink, I couldn’t get the lid off. Thinking it might be the result of a pressure differential, I put it in the freezer for a few minutes. Still no luck. So I asked my husband for help, which is when he noticed that the lid looked slightly crooked. It was definitely cross-threaded and in trying to unscrew it, I had only made the problem worse. It’s usually very obvious when the lid does go on wonky, and should have been noticeable even in the dark. 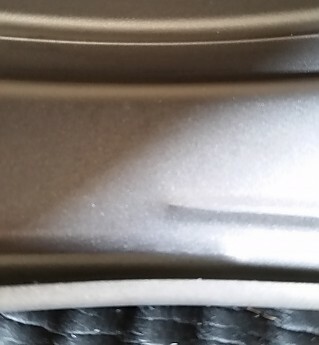 I even knew about cross-threading being an issue with the Bot and have been careful to give a half-turn to the left to align the lid, before screwing it to the right. In all my other trials, this always worked. So I still don’t know how I managed to do it and wonder if somehow the hot temps in the back of my car and left-over food residue somehow led to the problem during the drive home. Perhaps more astonishing, the Bot survived my not-so-graceful fix. I couldn’t accept being stuck (pun-intended) with a hunk of useless titanium, so I popped the high-side of the lid with a rubber mallet. With one whack, the threads seated correctly and suddenly the lid screwed right off! But surely there was damage? Nope, none that I can tell. 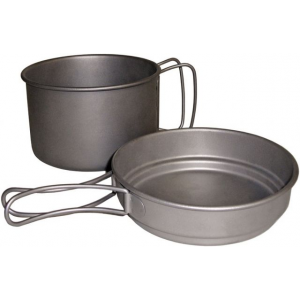 The lid still seals watertight, just as before, and all surfaces are clean and polished. But I do worry about this sort of thing happening in the field. And this wasn’t the first time that I noted the lid being hard to remove, either. In the heat of the day, pressure can form inside the pot, making the lid stick. I can’t really explain this phenomenon fully, so now I just try to leave the lid slightly loose when I am not transporting water/food. Vargo uses sturdy, thick titanium throughout. There is virtually no flexing when I press on the pot sidewalls, especially when the lid is affixed. I dropped the Bot from hip-level a couple of times and was not particularly gentle with it throughout my testing, yet it has not suffered any dents or gouges. The handle attachments appear solid, despite their minimal profile. The matte finish affords a good gripping surface. In discovering one of the Bot’s shortcomings (cross-threading the lid), I also learned that it can bounce back unscathed after being attacked with a rubber mallet. Despite a bit of the typical rainbow discoloration from high heat, it remains the same today as when I opened the box. Speaking of the box, the Bot comes packaged in this recyclable cardboard box. Minimalistic, like the Bot. I’d also like to state that I find the Bot very aesthetically pleasing. Like a raccoon attracted to shiny-objects, I am particularly fond of all-things titanium. A road bike, my wedding ring, and lots of Ti camping bling (stakes, hooks, carabiners, clips, spoons, and cookware)…can you see a pattern/problem here? It's a beautiful, durable, lightweight, and virtually maintenance-free metal and the Bot falls well in line with all these characteristics. Titanium’s biggest drawback is how prohibitively expensive it is. Again, the Bot fits that description too and is a reason I deducted half a star, as I think it is a bit expensive at $99 retail. Vargo undoubtedly makes some of the nicest Ti bling on the market, which comes at a price. If it’s something that will last forever and serve multiple purposes, then perhaps it’s worth it. 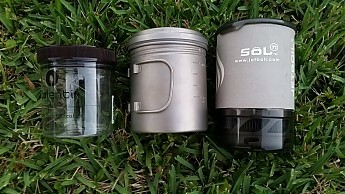 I matched the Bot 700 with two one-trick-pony comparisons, a Jetboil Sol Ti cup and a plastic screw-top container. This pairing is by no means exhaustive of the many alternatives, just a quick representation of favorites I have on hand. 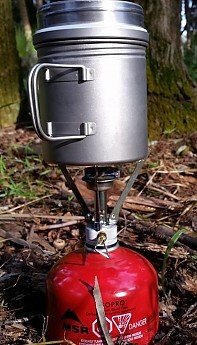 Some may wonder why the Jetboil, since it is not light compared to alcohol stoves, nor even the lightest of canister stoves (the BRS-3000T). Quite simply, I hate fussing with alcohol stoves and this is arguably the most efficient, quickest, and easiest of canister stoves for the weight. 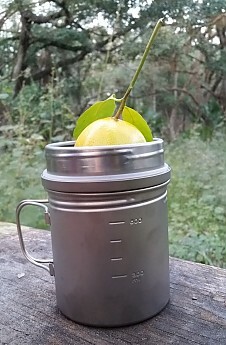 Generic screw-top container: 1.9 oz, cheap, easy to replace. It serves as a bowl, cup, water and pre-soak container. Minimalist capacity of about 500 ml but enough to soak a Near East couscous meal and other standard dehydrated backpacking meals. Durability is as-can-be-expected from a recycled product and the lid may leak, as there is no O-ring. It CANNOT be used to heat a meal on a stove or in a fire! 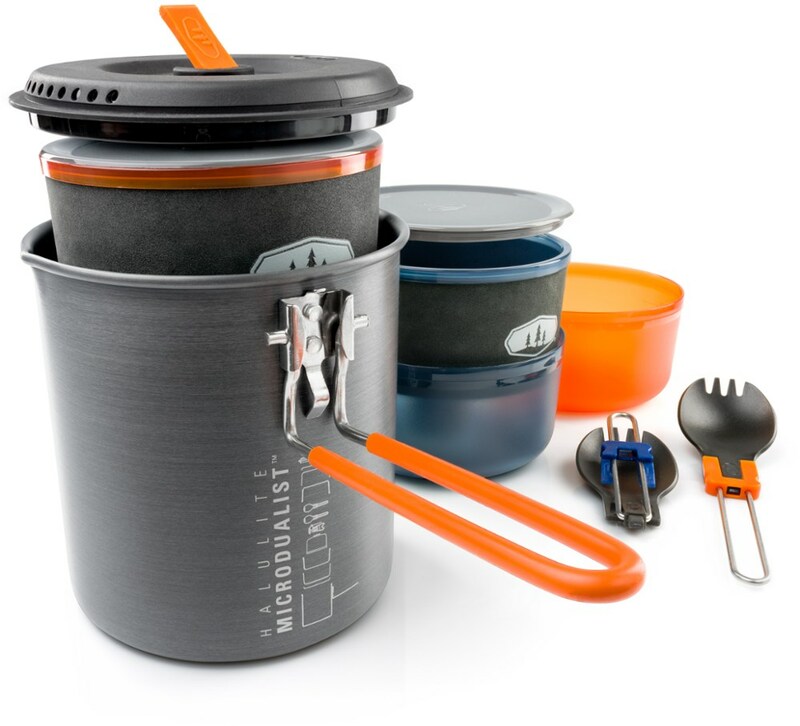 Jetboil Sol Ti cup paired with Jetboil Mini-Mo stove: 11 oz for the stove/800 ml Ti cup/cozy handle/lid/bottom protective bowl, 5 oz for just the cup/cozy/lid. These components are expensive and sold in separate configurations (I mixed and matched). 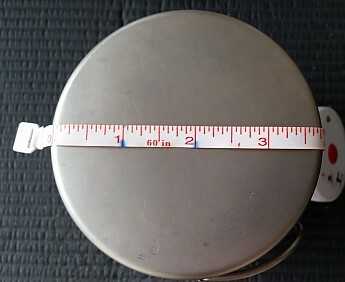 A fuel canister is required (additional weight/sourcing issues). This is a fully integrated and efficient cook system but the pot cannot be used as a mobile water or pre-soak container. The pot is also limited in that it will not work well with other stoves/placed directly in a fire. The manufacturer even cautions that it should only be used to boil water or cook liquid meals, since the heat exchanger has been known to separate. The Sol Ti has actually been discontinued for this reason. However, pots with an integrated heat exchanger are the best way to conserve fuel, and therefore stretch a canister longer and farther. The reduced size and weight of this pot make it the only one with a heat exchanger in the realm of UL products, but just barely. The Vargo Bot 700 fills a nice gap between these options. It weighs only 2.5 oz more than my plastic screw-top container but can do the same and so much more. It can be paired with any stove or set directly on top a fire, fireplace, grill, etc. For anyone not sure about which cooking method they will settle on, the Bot offers lots of flexibility. It may not be the very best at any one specialty, but it’s quite good at all its various functions. The biggest downside is the price. The Bot plays king of the hill while I stop to gather water in Big Cypress National Preserve. It's easy, just bend over! But it can be tricky to perch you pack above the water on cypress knees...it helps that I was only carrying about 10 lbs for a 3-day trip! I tested the Bot from Nov 2016 through January 2017 primarily during lightweight backpacking trips, as well as on some paddling excursions. 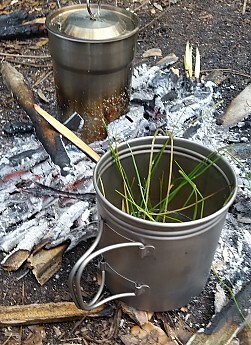 I cooked and boiled water using several canister stoves. 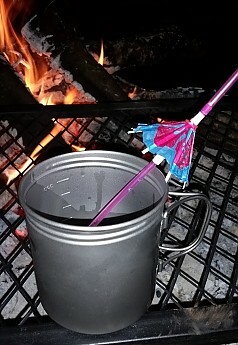 I heated water directly in a fire, practicing some long-forgotten ‘Buschcraft skills’. 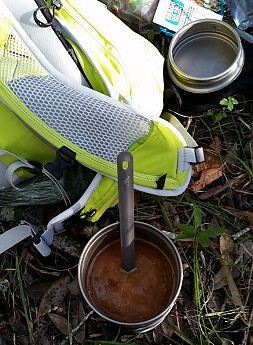 And I used the Bot exclusively as a cold-soak container for several multi-day backpacking trips on the Florida Trail. All-in-all, I’d say that I used the Bot within the range of its intended functions and some outside the range. Some conditions that I did not test it in, but are worth further consideration, are temps below freezing and use with an alcohol or wood stove. I would venture to guess that freezing conditions could cause issues for a fluid-filled Bot. Others have posted good results using it with a variety of stoves. 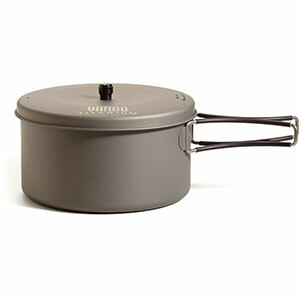 Though I only rated the Bot 4 stars (because of lid issues and the retail price), it is still one of my favorite products. 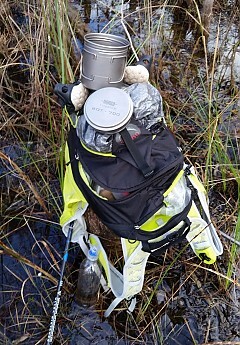 Given the multi-purpose attributes of the Bot, I would strongly consider it as my one and only container for an ultralight thru-hike (in addition to plastic water bottles and/or reservoirs). 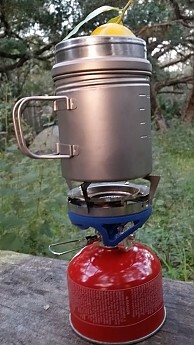 I would probably use the Bot in combination with a 1 oz BRS 3000T canister stove, ditching the stove if I find it unnecessary. The complete setup fits inside the Bot with room to spare: small canister (full), Hotlips, and BRS 300T together with the Bot weigh in at 12.5 oz! 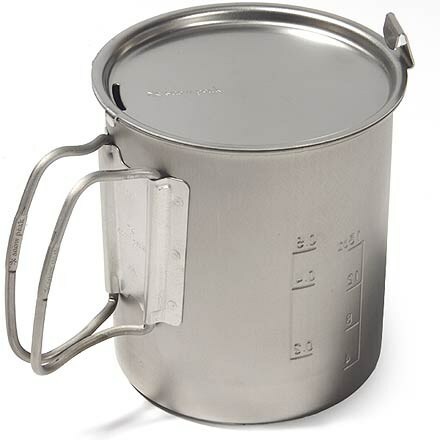 The nice thing about such a small stove and multi-function pot is that the stove can easily be mailed ahead or home, while the Bot can continue serving as a cold-soak container, mug, and occasional pot when a campfire or friend’s stove is a possibility for making a hot cup o' joe. Cold coffee is perhaps the most objectionable part of going stove-less, but like most anything, one can get used to even this. Thank you to Trailspace.com and Vargo for the opportunity to test the Bot 700! Update 2018: I have been using the Bot 700 for nearly 3000 miles and many months of thru-hiking. I have burned my fair share of couscous on the bottom and put in lots of scratches, but the Bot is still serving me well! I plan to use it on another thru-hike of the PCT summer 2018. I had one major but fortunately brief problem during this time. Upon arriving Auckland, New Zealand, I found that the lid was stuck but good! I tried for hours to unscrew it, seeing as how I not only needed the pot but also my stove that was trapped inside. I bruised my hands trying so hard. I also tried putting it in the freezer, to no avail. Then someone suggested a hot-boiling-water bath. I was doubtful this would work but presto! The top unscrewed nearly instantly. Somehow the low pressure from checked baggage on the flight must have created this problem. I hope this antidote helps people avoid similar issues. Update 2019: I am still using the Bot! It made it through the whole PCT, thus has about 5000 miles on it by now. I had another problem getting the lid stuck while on trail. I made a town stop in Etna, CA, coming down in elevation by about 3000 feet. I had left the lid screwed on too tight in the morning and yep, once again, stuck! I employed the hot-water bath trick and was finally able to coax it off. I might have put a few dents of frustration in the lid while trying to get it off, so it's looking a bit more beat-up, yet still perfectly functional. A fellow thru-hiker, Watermelon, suggested that I just remove the O-ring from then-on. I have followed his advice and not had any more "stuck" problems. Perhaps I have finally devised a way to avoid this problem. 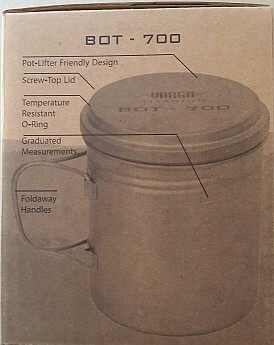 I also just purchased a new Bot 700 as a back-up and noted that Vargo has re-engineered the lid so that it feels like it won't get stuck or cross-threaded as easily. Time will tell but it shows that Vargo has listened to its customers and tried to make improvements. Despite the issues, I remain a Bot 700 fan. 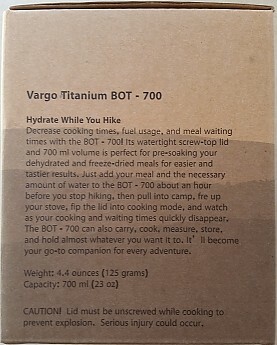 I have used the Bot 700 for three thru-hikes (Colorado trail, Te Araroa, and Pacific Crest Trail), plus numerous shorter trips, all totaling over 5,000 miles. 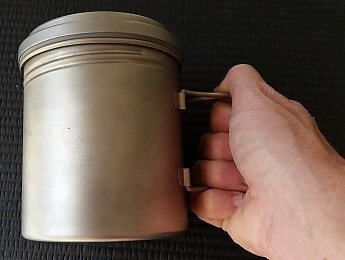 I plan to use it on my thru-hike of the CDT summer 2019. Nice review, Lah. Thorough as always. Having read about the cross threading from the 1L I have been hesitant to buy one of these. I can't imagine being on the trail and finding out you can access your cook pot. Great review, Lah! What a useful pot! Late to comment, but an excellent review! Just back from an overnight in Santa Monica Mountains (CA), and thought about your review I read months ago! Will buy this puppy, as wanted to pre-soak some noodles, and this will do it! Thanks! Thanks for the update and tip about the flight pressure on the pot. Glad you figured it out!